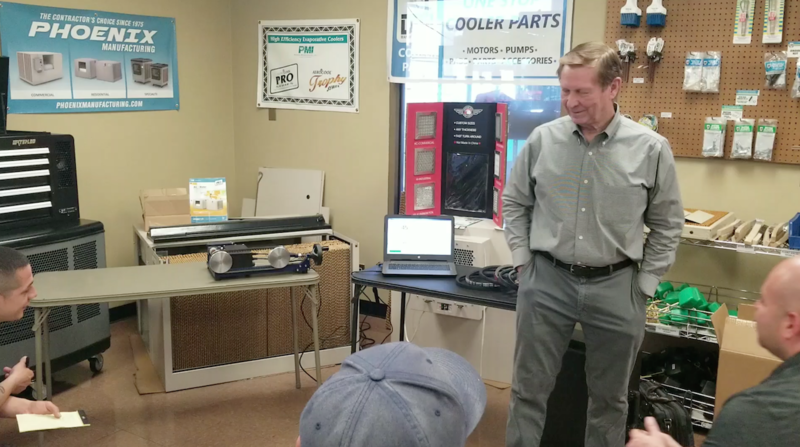 Nevada Cooler Pad, serving Southern Nevada for almost 65 years, recently hosted a training course by Bestorq, manufacturers of V-Belts and Timing Belts. Company owner Del Stork (pictured in the video link below) handled the training, which included a demonstration on how their new generation of belts, the X5 V-belts, provide less energy loss with almost twice the belt life. These new innovative belts are made from a compound that is more durable than the standard competitor’s brands. This demonstration was done for company A-1 and they were fully engaged! The energy demonstration machine they brought puts all brands of belts on the machine to test for wear and tear and efficiency and Bestorq was verifiably the best of all brands. They also did a demonstration on the importance of belt tension. They had the class attendees try to tension by hand and found that only 2% of professionals can do this by “feel” We now offer a belt tensioning tool that can precisely tension a belt properly on equipment to improve belt life and efficiency. Learn More About Bestorq: “Our main business is manufacturing V-Belts and Timing Belts. Our factory processes use the latest in global belt manufacturing technology and generate an output of over 800,000 belts per day, making us one of the largest manufacturers of Power Transmission Belts in the world. We are ISO9001 certified and all factory production takes place in a clean atmosphere with extremely high quality and delivery standards. We are selective about our machinery and technology to continually provide you with the best belt quality and durability possible. Following great success in Asia, Europe, Africa, Australia and South America, our USA operations now offer the complete line of Bestorq belts. In order to meet your requirements as quickly as possible, we maintain a large domestic inventory of stock belts that are ready to ship. At Bestorq, we constantly conduct dynamic testing in our factory labs as well as in our USA labs to make sure we attain the highest levels of performance. We meet and exceed all RMA standards and surpass the belt quality and durability of the best USA manufacturers. Our USA operations have a basis of over 50 years of belt manufacturing and development experience. We have the technical and operational knowledge to provide you with the products you need for the best possible power transmission performance. We have extensive stock belts and can also custom design solutions to meet your needs. Our knowledge paired with premium materials and world-class manufacturing processes creates a winning combination to help you succeed. optimize your belt drive efficiency To get the most from your belt drive, it is important that you pay proper attention to your V-Belt tensioning and pulley size. Proper V-Belt Tensioning All belts do not feel the same when properly tensioned. There are two main groups of belts that feel quite different based on the materials and tension cables used in their manufacturing processes. The first group of belts felt spongy or springy when properly tensioned, while the second group of belts felt very rigid and stiff but still aren’t properly tensioned. Bestorq and other major high-quality manufacturers are in this second group of belts. Rigid belts stretch very little over their life and need to “feel” tighter than spongy belts which will actually stretch far more during their life. When properly tensioned, rigid belts will feel 1.5 to 1.8 times tighter than spongy belts. Although they feel tighter, rigid belts will not place any more load on bearings than spongy belts. The objective is to have the lowest tension to carry the load and yet high enough tension so there is never belt slip. Due to the different belt groups, one should not use “feel” to judge the correct tension of a belt. To more accurately tension V-Belt drives use the Force-Deflection Method shown below.